Are sprinklers required in concealed spaces such as floor and roof cavities in multi-family wood-frame buildings? The International Building Code (IBC) requires all buildings containing Group R occupancies to have sprinklers throughout; however, the need for sprinklers specifically located in the concealed spaces of floors and roofs is dependent on the type of sprinkler system specified (NFPA 13 or NFPA 13R) and the use of fireblocking and draftstopping. The IBC specifies when sprinklers are required in a building (Section 903.2) and when fireblocking and draftstopping are required in concealed spaces (Sections 718.2 and 718.3). However, sprinkler requirements for concealed spaces are a function of the standard being used as the basis of design for the sprinkler system (i.e., NFPA 13, NFPA 13R, NFPA 13D). As this topic frequently arises on multi-family projects, it should be noted that IBC Section 903.2.8 requires an automatic sprinkler system throughout all buildings with a Group R fire area, regardless of construction type or framing materials used. For mixed-use buildings with a designated R occupancy, this would mean sprinklers are required even in areas of other occupancies. Section 718.3.2 Groups R-1, R-2, R-3 and R-4. Draftstopping shall be provided in floor/ceiling spaces in Group R-1 buildings, in Group R-2 buildings with three or more dwelling units, in Group R-3 buildings with two dwelling units and in Group R-4 buildings. Draftstopping shall be located above and in line with the dwelling unit and sleeping unit separations. Draftstopping is not required in buildings equipped throughout with an automatic sprinkler system in accordance with Section 903.3.1.1. It is important to recognize that these exceptions reference two different sprinkler system options; section 903.3.1.1 refers to an NFPA 13 sprinkler system while 903.3.1.2 refers to an NFPA 13R system. NFPA 13: Standard for the Installation of Sprinkler Systems is the baseline for all commercial and multi-family occupancies. However, multi-family occupancies up to four stories may utilize NFPA 13R: Standard for the Installation of Sprinkler Systems in Low-Rise Residential Occupancies. These standards have different requirements for concealed spaces as explained below. 8.15.1.1 Concealed Spaces Requiring Sprinkler Protection. Concealed spaces of exposed combustible construction shall be protected by sprinklers except in concealed spaces where sprinklers are not required to be installed by 8.15.1.2.1 through 8.15.1.2.18 and 8.15.6. 8.15.1.2.6 Concealed spaces formed by ceilings attached to composite wood joist construction either directly or onto metal channels not exceeding 1 in. (25 mm) in depth, provided the joist channels are firestopped into volumes each not exceeding 160 ft3 (4.5 m3) using materials equivalent to the web construction and at least 3-1/2 in. 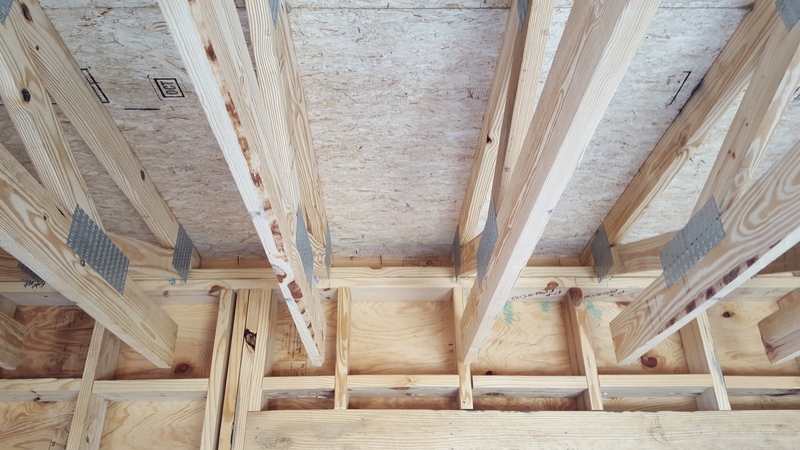 (90 mm) of batt insulation is installed at the bottom of the joist channels when the ceiling is attached utilizing metal channels, shall not require sprinkler protection. 8.15.1.2.7 Concealed spaces filled with noncombustible insulation shall not require sprinkler protection. 8.15.1.2.7.1 A maximum 2 in. (50 mm) air gap at the top of the space shall be permitted. 8.15.1.2.8 Concealed spaces within wood joist construction and composite wood joist construction having noncombustible insulation filling the space from the ceiling up to the bottom edge of the joist of the roof or floor deck, provided that in composite wood joist construction the joist channels separated into volumes each not exceeding 160 ft3 (4.5 m3) to the full depth of the composite wood joist with material equivalent to the web construction, shall not require sprinkler protection. The provision noted in NFPA 13 Section 8.15.1.2.6 is one of the most common exceptions used to eliminate the need for sprinklers in combustible concealed spaces. This requires compartmentalizing the floor/roof cavity into volumes not to exceed 160 ft3. The compartmentalization details vary with the type of floor/roof construction (solid sawn joists, trusses, I-joists, etc.) but most utilize wood structural panels or gypsum board to divide the cavity into the required volumes. IBC Sections 718.2 and 718.3 list one layer of ½-in-thick gypsum board or 0.719-in-thick wood structural panels as an acceptable fireblocking and draftstopping material. An article from the Structural Building Components Association provides some good discussion and details on this topic. Figure 717.3.3 of this document from the City of Palo Alto Inspection Division also shows a similar detail. 6.6.6 Sprinklers shall not be required in attics, penthouse equipment rooms, elevator machine rooms, concealed spaces dedicated exclusively to and containing only dwelling unit ventilation equipment, crawl spaces, floor/ceiling spaces, elevator shafts where the elevator installation complies with ANSI A17.1, Safety Code for Elevators and Escalators, and other concealed spaces that are not intended for living purposes or storage and do not contain fuel-fire equipment. Although not affected by sprinkler requirements, another item to consider when discussing details in the floor/roof cavity is fireblocking, specifically at the intersection of walls and floors/roofs. IBC Section 718.2.3 requires the following. Section 718.2.3 Connections between horizontal and vertical spaces. Fireblocking shall be provided at interconnections between concealed vertical stud wall or partition spaces and concealed horizontal spaces created by an assembly of floor joists or trusses, and between concealed vertical and horizontal spaces such as occur at soffits, drop ceilings, cove ceilings and similar locations. Standard wood-frame wall construction utilizes a double top plate. The commentary to 2012 IBC Section 718.2.3 notes that this top plate can act as the required fireblocking, indicating that no additional fire blocking is necessary: In platform framing, where gypsum wallboard is continued to the top plate of the wall, typically either the gypsum board or the top plate will serve to cut off the connection between the vertical and horizontal construction. Therefore, with many typical details, no additional fireblocking is needed at this location.